Assassin’s Creed Unity, the upcoming next-gen installment in the most critically acclaimed historical open world action-adventure stealth video game series, is shaping out to be pretty good. Despite the fact that the game runs at only 900p native resolution and 30 frames per second, it looks pretty impressive while running on the latest hardware. 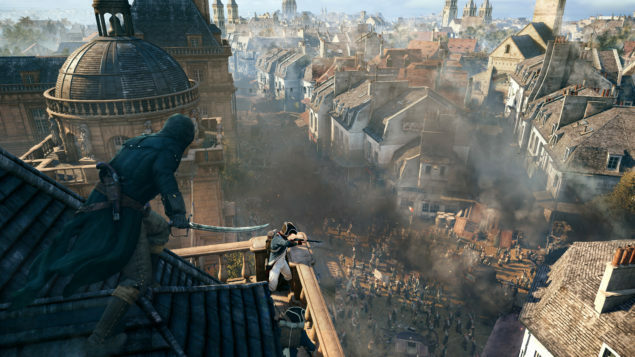 Set in the once-magnificent Paris, the upcoming most anticipated game features many venerable structures and buildings. Below is a screenshot comparison showing how the Assassin’s Creed Unity’s in-game Paris holds up against the real life city. Unlike previous chapters in the series, Ubisoft’s upcoming highly awaited and much boasted next-gen masterpiece features a large dynamic in-game world with eminently engaging and responsive environments. Set in the opulent city of Paris as it was back in the 18th century during the tragic French Revolution, Assassin’s Creed Unity offers a lot of space to players to just wander around the in-game world and explore the iconic spots that are historically of great value. Furthermore, the game even mirrors the desperate crowds of that time and features such art direction, level design and storytelling that all connect to the city of Paris. Assassin’s Creed Unity’s in-game version of Paris represents most of the city’s real life charm bathed in the next-gen visuals. Ubisoft Montreal has put its all efforts into works to match both versions of Paris, and make the game’s city a compelling place to hand out by aiming for historically accurate housing styles, interiors designs, and textures and atmospheric elements such as mist and smoke. The game features playable buildings and players will be able to directly enter and exit them without taking a break in play. All this will help players to explore the in-game world and know more about the 18th century real life Paris. Many of the 3D landmarks included in Assassin’s Creed Unity are very similar to their real life versions. Recently, Engadget went on an in-game Paris tour with Ubisoft and compared the buildings from the gameplay video to their real life versions. 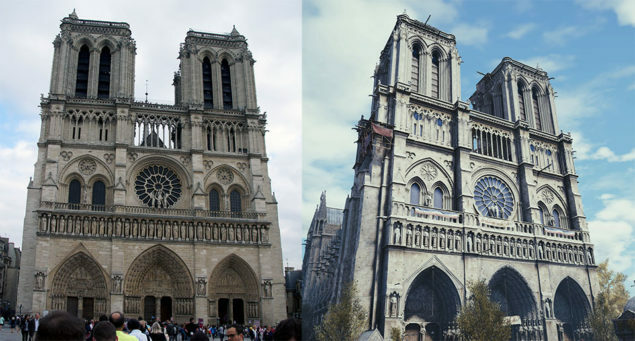 As you can see in the screenshot below, the developer has compared the in-game version of Notre Dame, a historic religious cathedral of Paris, to its real life version, and both of the structures are very much alike. Same is the case with several other buildings and structures, but currently we only have this one to share, so check it out below and stay tuned for more. Assassin’s Creed Unity launched on PC, PlayStation 4 and Xbox One this year on November 11. It was recently revealed that the game will run at 900p native resolution and 30 frames per second on both the latest video game consoles.